If there is one thing that seems to be a favorite among most people, it is pizza. It’s a deep dish delight that many of us love to eat on a regular basis and we may even have a night set aside for eating pizza each and every week! It can be made in so many different ways, with toppings that are absolutely amazing. More than likely, you have tried a number of different pizzas in your life and you may have had pizza made in more ways than you can imagine. When you see a pizza made as a blanket, however, you might just wonder why you had never thought about this before. 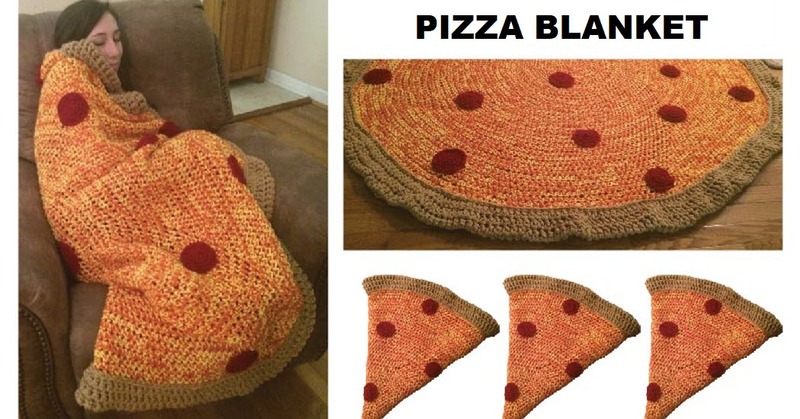 It’s the pizza crochet blanket and regardless of your feelings about the culinary delight, you are going to love wrapping yourself up in the warmth of something that was made with your own two hands. This particular delight was made by Jade Stoner and certainly, it is something that is going to rival the edible pizza in many of our lives. Okay, we may not quite go that far but when it’s cold outside and you want a little bit of comfort, there is nothing about wrapping yourself up in a warm pizza blanket and vegging on the sofa. 3. It even looks like a slice of pizza when it is folded!